Authorized on September 25, 1950 and amended on March 19, 1953. It is awarded to any service member or former service member of the Reserve Components of the Armed Forces of the United States who completes, or has completed, a total of ten year's of honorable and satisfactory military service, in one or more Reserve components of the United States Armed Forces. The Armed Forces Reserve Medal was established by Executive Order 10163 signed by President Harry S. Truman on September 25, 1950. The Armed Forces Reserve Medal has been awarded for qualifying service from September 25, 1950 to the present. The United States National Guard. The National Guard while in United States service. The Federally recognized National Guard before 1933. A Federally recognized status in the National Guard. The Officers Reserve Corps and the Enlisted Reserve Corps before March 25, 1948. The United States Army without component (usually, all enlisted service before July of 1940 was with the Regular component and is not creditable. Conversely, service after July 1, 1940 was with the United States Army and is creditable for the award). The Naval Reserve and the Naval Reserve Force, excluding members of the Fleet Reserve and the Fleet Naval Reserve transferred thereto after completing sixteen or more years active naval service. The Marine Corps Reserve and the Marine Corps Reserve Forces excluding members of the Fleet Marine Corps Reserve transferred thereto after completing sixteen or more years service. 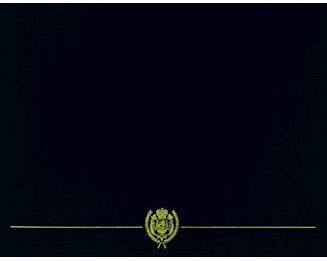 The Limited Service Marine Corps Reserve. The Naval Militia who have conformed to the standards prescribed by the Secretary of the Navy. The United States Air Force without component (includes Reserve Officers serving on active duty). Army: For members of the Army, the Armed Forces Reserve Medal is worn after the Military Outstanding Volunteer Service Medal and before the NCO Professional Development Ribbon. Navy: For members of the Navy, the Armed Forces Reserve Medal is worn after the Navy Recruiting Service Ribbon and before the Naval Reserve Medal. Marine Corps: For members of the Marine Corps, the Armed Forces Reserve Medal is worn after the Marine Security Guard Ribbon and before the Marine Corps Reserve Ribbon. Air Force: For members of the Air Force, the Armed Forces Reserve Medal is worn after the Air Force Longevity Service Ribbon and before the Air Force NCO Professional Military Education Graduate Ribbon. Coast Guard: For members of the Coast Guard, the Armed Forces Reserve Medal is worn after the Coast Guard Recruiting Service Ribbon and before all foreign decorations. 1. Description: A bronze medal 1 inch in diameter, with a flaming torch in front of a crossed powder horn and a bugle within a circle composed of thirteen stars and thirteen rays. On the reverse is a different design for each of the reserve components. The reverse of all medals have the inscription "ARMED FORCES RESERVE" around the rim. Organized Reserve: On a wreath, the Lexington Minuteman statue as it stands on the Common in Lexington, Massachusetts encircled by thirteen stars. National Guard: The National Guard insignia (two crossed fasces superimposed on an eagle displayed with wings reversed. Air Force Reserve: The crest from the Air Forces seal (on a wreath, an eagle displayed in front of a cloud form). Naval Reserve: The center device of the Department of the Navy seal (an eagle displayed on an anchor in front of a ship in full sail). Marine Corps Reserve: The Marine Corps insignia (eagle perched on a globe superimposed on an anchor). Coast Guard Reserve: The central design of the Coast Guard seal (crossed anchors superimposed by a shield within an annulet). 2. Devices (DVC): Bronze hourglass (HG) to indicate 10 years service; silver hourglass to indicate 20 years service; gold hourglass to indicate 30 years service; letter "M" to indicate mobilization in support of US Military operations or contingencies designated by the Secretary of Defense; and a numeral to indicate number of times mobilized. 3. Ribbon: The ribbon is 1 3/8 inches wide and consists of the following stripes: 1/16 inch Bluebird 67117; 1/32 inch Chamois 67142; 1/16 inch Bluebird; 1/32 inch Chamois; 1/16 inch Bluebird; 3/8 inch Chamois; center 1/8 inch Bluebird; 3/8 inch Chamois; 1/16 inch Bluebird; 1/32 inch Chamois; 1/16 inch Bluebird; 1/32 inch Chamois; and 1/16 inch Bluebird. a. Awarded for honorable and satisfactory service as a member of one or more of the Reserve Components of the Armed Forces of the United States for a period of 10 years within a 12-year period. Upon completion of the fourth 10-year period, a gold hourglass followed by a bronze hourglass shall be awarded. b. Awarded for mobilization on or after 1 August 1990, to members called to active duty and served under Title 10, United States Code (USC) (Defense Department) or Title 14 USC (Coast Guard) or the member volunteered and served on active duty in support of US Military operations or contingencies designated by the Secretary of Defense. The "M" device is worn to indicate mobilization. Subsequent mobilizations are denoted by the wear of a number to indicate the number of times mobilized. No hourglass is worn unless authorized under the above paragraph. a. Medal (regular size): MIL-DTL-3943/231. (Stock number for the full size medal set with ribbon bar.) National Guard: NSN 8455-00-227-1713; USAR: 8455-00-269-5781.
b. Medal (miniature): MIL-DTL-3943/231. Available commercially. c. Ribbon: MIL-DTL-11589/13. NSN 8455-00-265-4916. Source: The provisions of Executive Order 10163 of Sept. 25, 1950, appear at 15 FR 6489, 3 CFR, 1949-1953 Comp., p. 345, unless otherwise noted. 1. There is hereby established the Armed Forces Reserve Medal, with accompanying appurtenances and devices, for award to members and former members of the reserve components of the armed forces of the United States as hereinafter provided. 2. 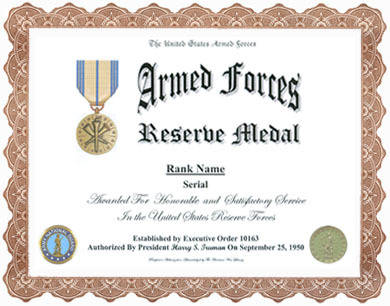 The Armed Forces Reserve Medal shall be of such design as the Secretary of Defense shall approve: Provided, That the obverse face of the medal shall be of the same design in all cases, and the reserve face shall be distinctive in design with respect to each reserve component of the armed forces of the United States, including the Coast Guard Reserve and the Marine Corps Reserve: And provided further, That the reverse face of the medal to be awarded to members of the Coast Guard Reserve shall be of such design as the Secretary of the Treasury shall approve. 3. The Armed Forces Reserve Medal may be awarded to members or former members of the reserve components of the armed forces of the United States, including the Coast Guard Reserve and the Marine Corps Reserve, who complete or have completed a total of ten years of honorable service in one or more of such reserve components, including annual active-duty and inactive-duty training as required by appropriate regulations: Provided (1) that such ten years of service is, or has been, performed within a period of twelve consecutive years, (2) that such service shall not include service in a regular component of the armed forces, including the Coast Guard, but (a) service in a reserve component which is concurrent, in whole or in part, with service in a regular component of the armed forces shall be included in computing the required ten years of reserve service, and (b) any period of time during which reserve service is interrupted by service in a regular component of the armed forces shall be excluded in computing, and shall not be considered a break in, the said period of twelve consecutive years, and (3) that such service shall not include service for which the Naval Reserve Medal or the Marine Corps Reserve Medal has been, or may be, awarded: And provided further, that any medal awarded hereunder shall be of the design distinctive of the reserve component in which the person to whom it is awarded is serving at the time of the award or in which such person last served. 4. Not more than one Armed Forces Reserve Medal may be awarded to any one person, but for each succeeding ten-year period of service as above described a suitable device may be awarded, to be worn with the medal in accordance with appropriate regulations. 5. A member of a Naval or Marine Corps Reserve component who is eligible to receive a Naval Reserve or Marine Corps Reserve Medal may at his election be awarded, in lieu of such medal, the Armed Forces Reserve Medal. 6. The Armed Forces Reserve Medal shall be awarded in lieu of the Naval Reserve and the Marine Corps Reserve Medals for service performed after twenty years from the dates on which such medals were established. 7. Subject to the provisions of this order, the Armed Forces Reserve Medal shall be awarded under such regulations as the Secretaries of the military departments of the Department of Defense and the Secretary of the Treasury shall severally prescribe. Such regulations shall, so far as practicable, be of uniform application, and regulations issued pursuant to this order by the Secretaries of the military departments of the Department of Defense shall be subject to the approval of the Secretary of Defense. AP4.1.2.56.1.1.3. Such service shall not include service for which the Naval Reserve Medal or the Marine Corps Reserve Medal has been or may be awarded. AP4.1.2.56.1.2. On or after August 1, 1990, the member was called to active duty and served under Sections 12301(a), 12302, 12304, 12406 of title 10, U.S.C., or Chapter 15, or, in the case of the United States Coast Guard Reserve, Section 712 of title 14, U.S.C. AP4.1.2.56.1.3. On or after August 1, 1990, the member volunteered and served on active duty in support of specific U.S. military operations or contingencies designated by the Secretary of Defense, as defined in Section 101(a)(13) of title 10, U.S.C. (reference (nnnn)). AP4.1.2.56.2. The hourglass is awarded under paragraph AP4.1.2.56.1.1., above, as follows: Upon completion of the first 10 year-period award, a bronze hourglass shall be awarded. Upon completion of the second 10 year-period award, a silver hourglass shall be awarded. Upon completion of the third 10 year-period award, a gold hourglass shall be awarded. Upon completion of the fourth 10 year-period award, a gold hourglass followed by a bronze hourglass shall be awarded. The "M" device is awarded under paragraphs AP4.1.2.56.1.2. and AP4.1.2.56.1.3., above, as follows: When a member qualifies for the "M" Device, the bronze "M" shall be awarded, positioned on the ribbon and medal, and a number shall be included on the ribbon and medal. No more than one Armed Forces Reserve Medal may be awarded to any one person. Multiple periods of service during one designated contingency (under paragraphs AP4.1.2.56.1.2. and AP4.1.2.56.1.3., above) shall count as one "M" Device award. AP4.1.2.56.3. Appropriate wear of the ribbon shall be as follows: If no "M" device is authorized, the appropriate hourglass shall be positioned in the center of the ribbon. If no hourglass is authorized, the "M" device shall be positioned in the center of the ribbon, followed by Arabic numerals indicating the number of times the device has been awarded (e.g., 2 to 99--no number is worn for the first award). If both the hour glass and the "M" device are awarded, the hourglass(s) shall be positioned in first position on the ribbon (at the wearer's right), the "M" device in middle position, and the number of times the "M" device has been awarded in the remaining position (at the wearer's left). AP4.1.2.56.4. Active Guard and Reserve (AGR) members who receive orders changing their current duty status (legal authority under which they perform duty), their duty location, or assignment to support a contingency operation are eligible for the award of the "M" device.